The Celts are a people who have inhabited Europe since the early Iron Age. Whilst they were once the pre-eminent power in Europe conflicts against the Ancient Romans, migrating Germanic tribes and internecine warfare led to a loss of much of their influence. Today Celtic languages are still the primary spoken language along parts of the European Atlantic fringe. The International Celtic Congress recognizes the modern Celtic heartland to consist of Scotland, The Isle of Man, Ireland (north and south combined), Wales, Cornwall and Brittany. Some regions where no significant numbers of Celtic language speakers remain are often considered Celtic including England and Galicia. 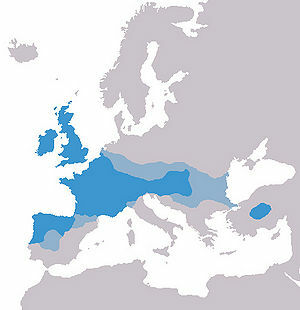 Whilst it had been previously thought that invading Germanic peoples such as Saxons from the continent and Vikingr from Scandinavia had totally wiped out the Celts in eastern England, genetic studies now show that the replacement was merely cultural with the majority of DNA in England sharing much the same indigenous origins as that of the culturally Celtic portion of the British Isles. The origin of the Celts is currently disputed, genetic evidence suggests the Celts originated in south-west France  whilst cultural and some historical evidence suggests that the Celts originated in Switzerland. The Celts were never a single unified power but rather a collection of related tribes and kingdoms which, in the 3rd century BC, at their greatest spread covered vast swathes of Europe from the Black Sea to the Atlantic Ocean. Much of the early accounts of the Celts come from Hellenic sources as the Celts had little written language until the Middle Ages. Because the greatest contact between the Celts and Greeks was martial much of the early records are of such a nature and also of uncertain neutrality. One non-military account of the early Celts is from the Latin writer Avienus who states that the Celts were famous seafarers who built vessels from leather rather than pine. The dominance of the Celts over Europe was gradually replaced by the rise of Rome and then finished on the continent by the great Germanic migrations that caused Rome's fall. Whilst the Celts in mainland Europe were in catastrophic decline the Insular Celts of the British Isles were thriving. The Insular Celts were a major factor in the spread of Christianity in north-west Europe during this time. During the Middle Ages the smaller Celtic kingdoms of the British Isles amalgamated into larger kingdoms, such as Rìoghachd na h-Alba which later became the kingdom of Scotland. Much of the history of the Celts at this time is occupied with internal conflict amongst rival Celtic Kingdoms and Clans and external conflict against Anglo-Saxons, Vikings and Normans. The growth of the British Empire provided a vehicle for the spread of Celtic people to far-flung regions of the world. The diaspora of Goidelic Celts was particularly large, due in large amount to the high proportion of Scots and Irish in the armies of the British Empire and also the catastrophic effects of the potato famines and the Highland clearances on Goidelic regions of Britain. The majority of Australians and New Zealanders have Celtic roots. Canada is another place that received a particularly large amount of Celtic immigration, mostly from Scotland, and at one time Scottish Gaelic was the third most prevalent language after English and French. Today Gaelic in Canada is much less important with only a few thousand speakers remaining, most of whom live on Cape Breton Island in Nova Scotia. Irish immigration to the United States also had an important impact on its history, and though migration of non-Celtic peoples to the USA has always been much higher than in the antipodes, leading to a large dilution of Celtic blood, the cultural impact of the Irish on contemporary American culture and religion has been disproportionately large. Important issues affecting Celts today include the preservation and expansion of their languages which are threatened by the global spread of English and also by greater autonomy in the Celtic nations. Whilst the United Kingdom and the Republic of Ireland are now becoming more and more aware of these issues, the situation is rather different in France where regional autonomy and indigenous languages are a politically sensitive subject. The name "Celt" and the adjective "Celtic" is correctly pronounced as if it began with K as there is no soft C sound in any Celtic language. The Boston Celtics basketball team is named after the Celts, a loose reference to Boston's Irish association; the team name is always pronounced with a soft c, as if it were spelled "seltics"; the same applies the Glasgow football team Celtic F.C. ↑ Oppenheimer, S. (2006) The Origins of the British: A Genetic Detective Story. Robinson Publishing. ↑ Rankin, D. (1996) Celts and the classical world. Routledge.